The youngsters from St Ann’s Rangers were not in a playful mood last weekend. 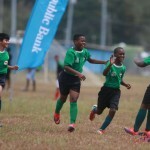 On Saturday 25 June, their Under-14 and Under-16 teams combined to score a whopping 14 goals as North Zone action got underway in the Republic Bank National Youth League (RBNYL). Photo: La Horquetta SA attacker Aydan Williams (left) takes on a Trincity Nationals opponent during Republic Bank National Youth League action on 4 June 2016. Williams scored the equaliser as the teams played to a 1-1 draw. Rangers’ senior team finished bottom of the 2015/16 Pro League standings despite some really battling performances. However, owner Richard Fakoory may be smiling at the promise coming through his team’s academy. 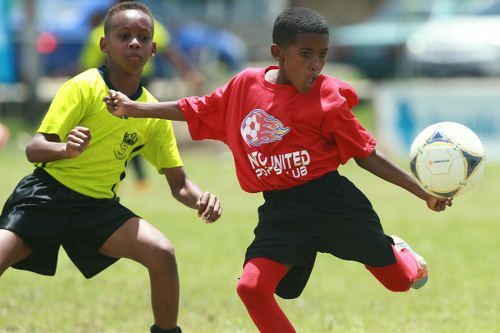 Although Fakoory will not be able to summon these youngsters for senior duty just yet, their respective teams were able to give Santa Cruz United and T&T Maestros International the runaround on Saturday afternoon. 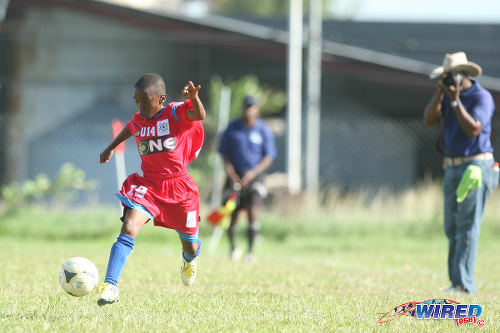 Keron Manswell and Jean-Neim McFee starred for Rangers, playing major roles in both the Under-14 and Under-16 games. 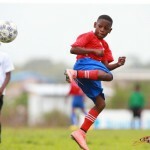 The duo combined for five goals in Rangers’ 9-4 thumping of Santa Cruz’s Under-14s, with Manswell bagging a hat-trick. They netted a goal apiece in the 5-1 rout of the Maestros International’s Under-16 team. Rangers aren’t having things all their own way in the North though, as their teams still sit in second spots despite their emphatic performances. Photo: St Anns Rangers attacker Kaviel Bennett sprints down the flank during their quarterfinal win over Cap Off Youths in the 2015 Republic Bank National Youth Cup. 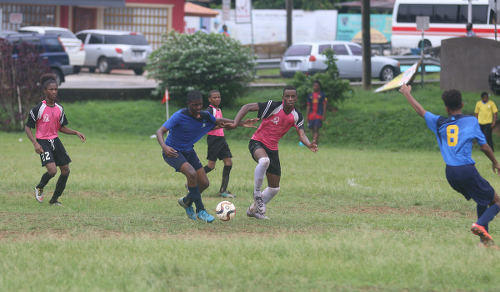 Police FC hold the edge on goal difference in the Under-16 category thanks to an 8-1 mauling of Laventille United, while Queen’s Park Cricket Club (QPCC) Football Academy has slight control in the Under-14 category having played one game more than their St Ann’s counterparts. The boys in sky blue have shown that they have much more than just cricket skills, and they too routed Maestros International in style as they walked away with a 5-2 victory. 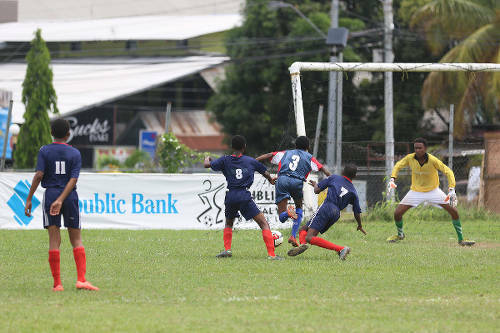 Zachary Welch and Andrew De Gannes both bagged braces as the young Parkites edged to the top of the four-team Under-14 group with four points from two games. 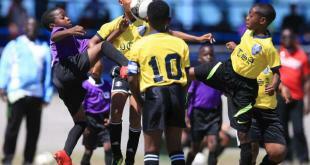 QPCC’s Under-12 team had a more difficult task against Trendsetter Hawks as they battled to a 3-2 victory. 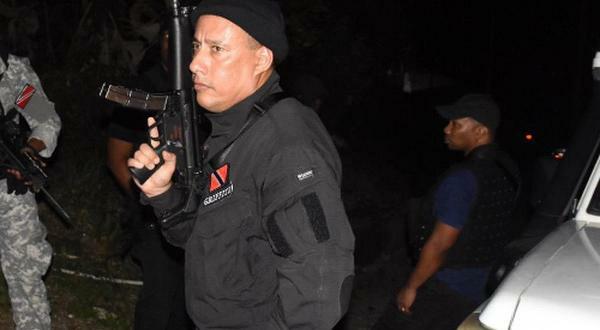 Trendsetter has risen to become one of the more popular names in TT youth football under the stewardship of Anthony “Dada” Wickham. Their tenacious spirit was not enough though to stop a game-winning double by Aalon Wilson-Wright. Trendsetter’s Abdul Hypolite scored a double of his own, but his team is now three points off of the pace set by the Parkites after two games in group play. Photo: A Pinto United SC player (right) prepares to strike the ball, despite the attentions of an Adrenaline FA opponent, during Republic Bank National Youth League East Zone Under-12 action on 4 June 2016. Pinto won 4-0. 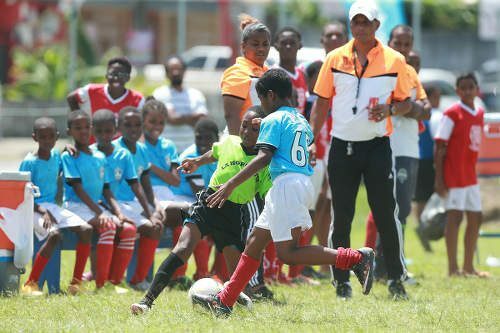 In the South, last year’s national Under-11 winners, Uprising Youths, are showing that they are ready for another prosperous run, as their Under-12 and under-14 teams both got off to successful starts. 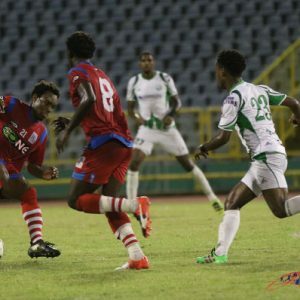 Shemar Ramlal and Simon Modeste were able to seal a 2-nil victory over WEZ Pro S.A.F.E. 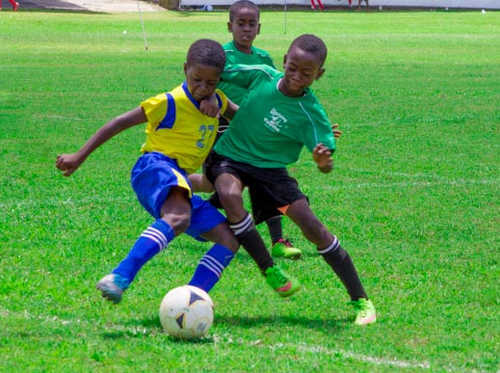 in the Under-12 action, while the Under-14s managed a healthy four points from their games against Club Sando and WEZ Pro. Ezekiel Kejar managed a double in Uprising’s 4-0 win over Club Sando, but his lone item was not enough to squeeze past a battling WEZ in the subsequent encounter as the game finished 1-1. Palo Seco FC and Gasparillo Youths got off to winning ways in the Under-16 division as they registered respective 3-1 and 7-0 wins. Palo Seco goals came from Terrance Carter, Kervon Telesford and Trevon Augustine as they came from behind to defeat St Mary’s SC. The Gasparillo contingent just swatted away their Ste Madeleine Strikers opponents a commanding seven times. 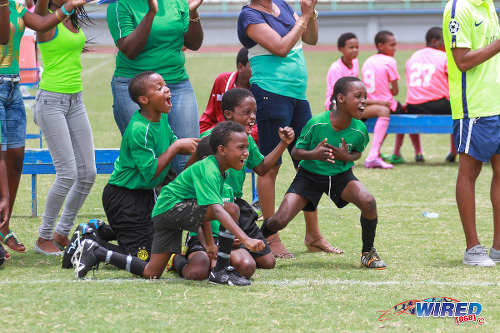 Photo: Uprising Youths substitutes get excited as their team clinches the Republic Bank 2015 National Youth Cup Under-11 crown at the Larry Gomes Stadium in Malabar. 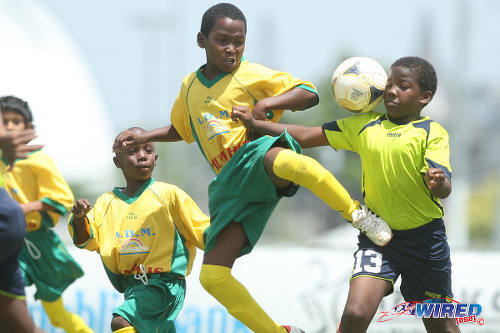 Photo: A WEZ Pro player (left) battles for the ball with an Uprising Youth opponent during Under-11 South Zone action in the 2015 Republic Bank National Youth Cup. Crowne Trace FC vs Mafeking United FC, 1pm.